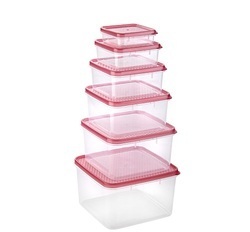 These plastic containers can be used to store a variety of food products as well as toys & other items. They are food grade with the base in clear plastic with print. Can be used to store various food items like rice, pulses, wheat flour and other household items. Leading Manufacturer and Exporter of Bio Plastic Containers. We are engaged in offering a wide range of Acid Packing Container to our prestigious customers. These products are tested by our quality controllers on various pre-defined parameters at every level of products development. This helps in ensuring supply of an immaculate range of products. We store these containers safely in our sound warehouse in an organized and systematic manner. 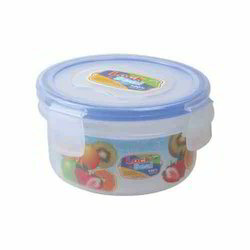 Poly proelen container available in size 200gm & 400gm. mainly use of container are petroleum jelly as well as food & confectionery. Unique corver design, 4 different design, 4 different sizes, leak resistance, 100% virgin material, 100% food grade material, 3 pcs set shrink. Being a well-distinguished company in the market, we are into offering Plastic Rib Container. Our offered 15 Litre Plastic Container is manufactured at state-of-art production unit. Owing to our in-depth knowledge in this domain, we are specialized in providing Plastic Airtight Container.